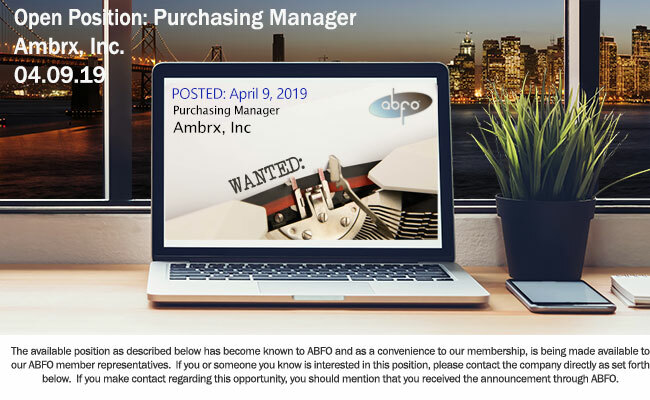 New ABFO Open Job Posting - Purchasing Manager, Ambrx, Inc.
Ambrx®, Inc. is an established biopharmaceutical company with a mission to deliver breakthrough protein therapeutics using an expanded genetic code. Unlike conventional conjugation techniques that create a mixture of suboptimal molecules, Ambrx technology combines site specific conjugation with proprietary linkers, payloads, and pharmacokinetic extenders to create a single molecular species that is optimized for safety, efficacy, and biophysical properties. We call this process Protein Medicinal Chemistry™. Ambrx is seeking a highly motivated Purchasing Manager to be a key member of a fast-paced and dynamic organization. The successful candidate will be responsible for managing Ambrx’s overall procurement strategy and operations. The position will develop and monitor key supplier relationships, establish business partners across functions, and implement strategies to source the business effectively and in compliance with our policies. This position will also be responsible for maintaining contractual agreements for the company. This position will report to the Vice President of Finance. Manage vendor relationships and activities of the onsite supplier representatives. Maintain Great Plains purchase requisition module and ensure that the controls are functioning appropriately and efficiently. Establish, maintain and centralize the contracts base. Negotiates and administers corporate contracts and related auxiliary agreements and guides and coordinates contracts professionals, where applicable, on such activities. Bachelor’s degree and 5-7+ years of purchasing experience, including 3-5 years of direct purchasing experience in the Biotech/Pharmaceutical industry.